The 12-lead ECG shown below in Figure-1 was obtained from a patient with new-onset shortness of breath thought to be due to congestive heart failure. What else do you suspect? Figure-1: ECG from a patient with new heart failure. (Figure reproduced from ECG-2014-ePub). 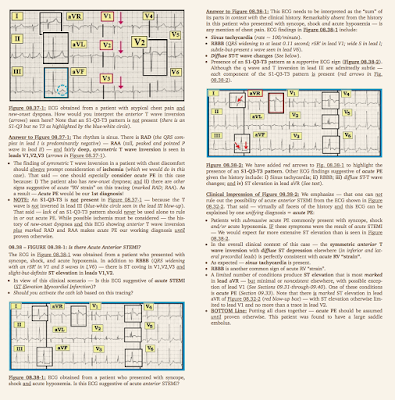 NOTE — Enlarge by clicking on Figures — Right-Click to open in a separate window (See text). There is marked RAD (Right Axis Deviation) — as determined by the predominantly negative QRS complex in lead I, but positive QRS in aVF. RAA (Right Atrial Abnormality) is present (tall, peaked, “uncomfortable-to-sit-on” P wave in inferior leads that is clearly >2.5mm in lead II ). An incomplete RBBB is seen (rsR’ in lead V1; S waves in I,V6 ). Deep S waves persist through to leads V5,V6. There are nonspecific ST‑T wave abnormalities — albeit not quite RV strain (and no acute changes). ECG Impression of Figure-1: The combination of marked RAD, definite RAA, IRBBB and persistent precordial S waves all point to a diagnosis of RVH. Clinical Impression: This ECG should make one rethink the premise of left-sided heart failure as the primary cause of this patient’s new-onset shortness of breath. Instead — longstanding/severe pulmonary disease is likely given the combination of findings (possible pulmonary embolism? ). Beyond-the-Core: There is also LAA (Left Atrial Abnormality) — as determined by very deep negative component to the P wave in lead V1. Whether this reflects anatomic enlargement vs increased LA pressure is uncertain. 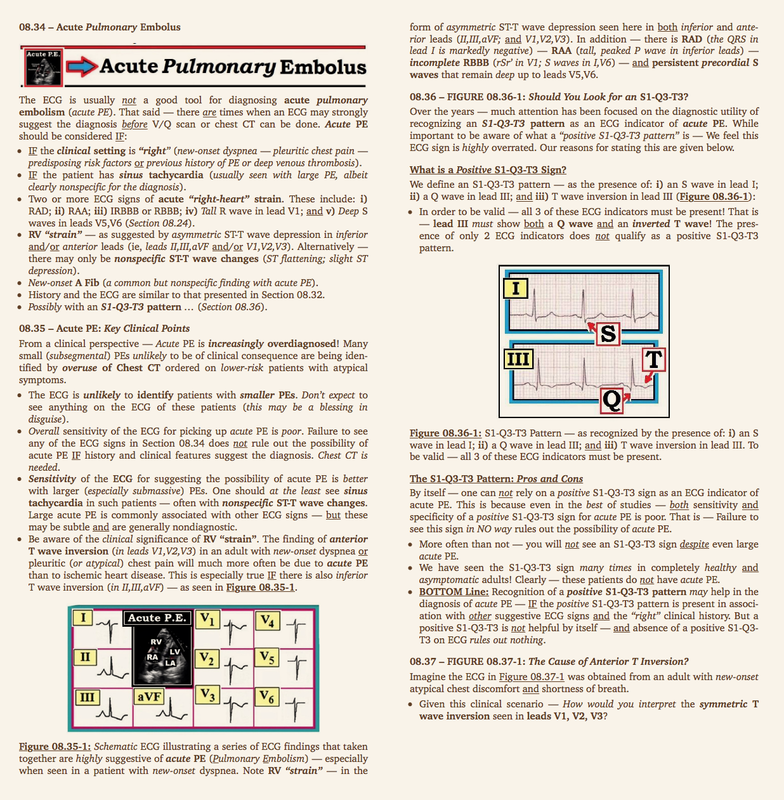 ECG Blog #73 — reviewed LVH. 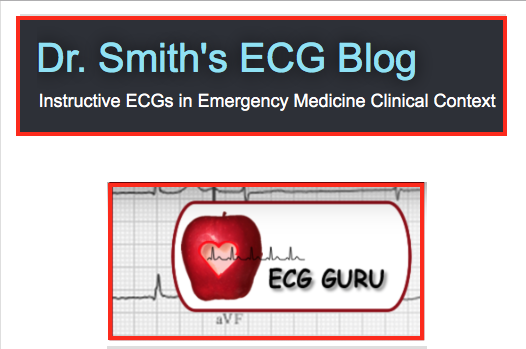 ECG Blog #75 — reviewed atrial chamber enlargement. 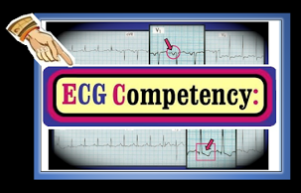 This goal of this blog post is to review ECG criteria for diagnosing RVH. Detection of right ventricular enlargement in adults by ECG criteria is often exceedingly difficult. This is because the LV (Left Ventricle) is normally so much larger and thicker than the RV (Right Ventricle) in adults — that it masks even moderate increases in right ventricular chamber size. As a result, many patients with RVH (Right Ventricular Hypertrophy) will not be identified — IF assessment for chamber enlargement is limited to obtaining an ECG (an Echo is needed to know for sure). NOTE: In contrast to adults — ECG diagnosis of RVH is often surprisingly easy in children with congenital heart disease (because relative size of the RV compared to the LV is not nearly as different as it is in adults). 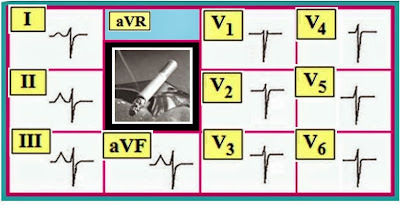 ECG criteria for diagnosis of RVH are listed in Figure-2. Several criteria are needed for accuracy. Figure-2: ECG criteria for RVH. 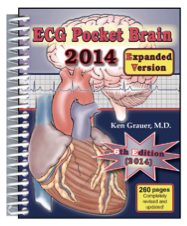 (Figure reproduced from ECG-2014-ePub). Consider Pulmonary Disease — IF you see 2 or more of the first 5 criteria listed in Figure-2 (especially if the patient is a known smoker or has other known lung problems). Suspect pulmonary disease plus RVH — IF in addition you also see a tall R wave in lead V1 (with or without ST-T wave changes of RV “strain” ). By Definition — By the time you see clear ECG evidence of RVH in an adult — the extent of RVH is usually marked (the patient almost always has end-stage COPD and/or pulmonary hypertension). While none of the criteria in Figure-2 by itself is enough to diagnose RVH — seeing several criteria on a single tracing is very suggestive of RVH — especially when seen in a likely clinical setting (ie, COPD, longterm asthma, right-sided heart failure, pulmonary hypertension). RAD (Right Axis Deviation) — is highly suggestive of RVH when seen in association with other criteria listed in Figure-2. Few other conditions produce RAD. Thus, the presence of marked RAD in Figure-1 virtually confirms the diagnosis of RVH. Indeterminate Axis — Alterations in lung volume with emphysema often lead to rightward and posterior axis deviation. As a result — net QRS deflection in both leads I and aVF will be negative. IF ever you see an indeterminate axis — Think RVH – COPD – large body habitus. RAA (Right Atrial Abnormality) — The tall, peaked, pointed P waves of RAA are easy to recognize (Figure-1). Only one condition produces RAA without RVH (= tricuspid stenosis). Therefore — seeing RAA is an indirect sign that RVH is very likely (See ECG Blog #75 — for more on ECG diagnosis of RAA). IRBBB (rSr’ in V1) — The presence of an r’ (r prime) in lead V1 suggests that terminal electrical activity is directed toward the right. While by itself this ECG sign is benign and commonly seen as an isolated finding in otherwise healthy individuals — it supports the diagnosis of pulmonary disease/possible RVH if seen in association with other findings listed in Figure-2. Persistent S Waves — R wave amplitude normally increases as one moves across the precordial leads (as electrical activity moves to the left where the larger LV lies). R wave amplitude usually peaks (is tallest) in V4 or V5 — and then drops off (in V5,V6). Normally, there is not any S wave at all in V5,V6 — since by this time in the depolarization process all electrical activity is traveling leftward. IF more than tiny S waves are still present in V5,V6 — this implies significant rightward activity (Think RVH – COPD – large body habitus). Low Voltage — Air is not a good conductor of electricity. 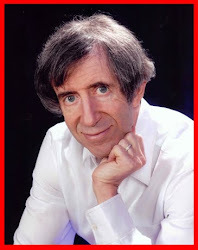 The large emphysematous chest of a patient with COPD dampens (reduces) voltage. Technically — “low voltage” is defined as QRS amplitude ≤5 mm (ie, ≤1 large box) in all 6 limb leads (I,II,III,aVR,aVL,aVF). That said — we also use “low voltage” as a relative term when overall QRS amplitude subjectively appears to be reduced. When you see “low voltage” — Think COPD. NOTE: Low voltage may also be seen in hypothyroidism; obesity; pneumothorax; pericardial effusion; and as a normal variant. That said — low voltage is not all that common, so its presence should make you consider the possibility of pulmonary disease. RV “Strain” — Just as LV “strain” is a sign of true LVH — seeing “strain” in right-sided leads (II,III,aVF — or — V1,V2,V3) strongly supports a diagnosis of RVH. 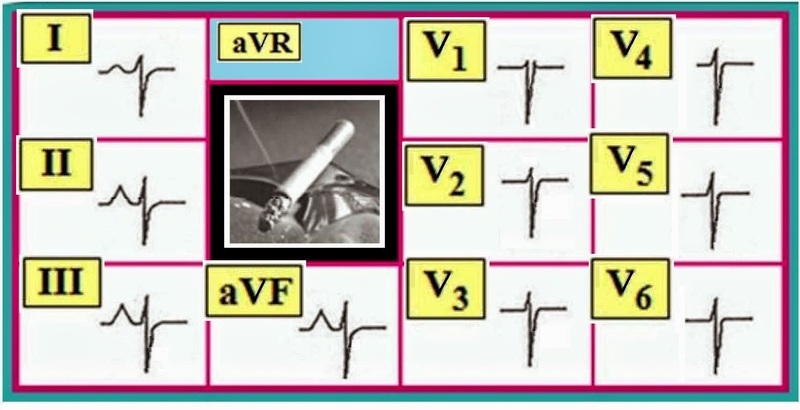 Most of the ECG criteria for RVH that we listed in Figure-2 are present in schematic Figure-3. Specifically — We see RAD; RAA; tall R in V1; and deep S waves in V5,V6. Note also that there is "RV strain" (which is typically seen in inferior and/or anterior leads — both of which are present here). PEARL: Inferior and/or anterior ST-T wave changes as seen in Figure-3 will often not be due to ischemia — but rather to RVH or pulmonary embolus. Figure-3: Schematic example of RVH + RV “strain”. This ECG picture with virtually all criteria from Figure-2 is uncommon in adults — and usually indicates marked RVH/end-stage COPD — and/or pulmonary hypertension. (Figure reproduced from ECG-2014-ePub). An indeterminate axis (negative QRS in leads I and aVF). RAA (tall, peaked P wave in inferior leads). Persistent S waves throughout the precordium. Figure-4: Schematic ECG that strongly suggests “pulmonary” disease. (Figure reproduced from ECG-2014-ePub). Return to FIGURE-1: Is there RVH? Return to the ECG we originally presented in Figure-1. It should now be apparent that RVH is clearly present. Specifically — We see marked RAD; RAA; IRBBB (if not a taller-than-expected r’ in V1); and persistent deep S waves in V5,V6. Awareness that the ECG of this patient shows RVH rather than LVH suggests cor pulmonale (if not pulmonary embolism) as the cause of acute dyspnea. Treatment is very different than it would be for left-sided heart failure. 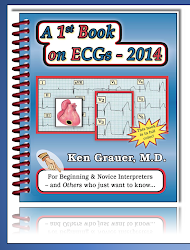 ADDENDUM: The following Sections are excerpted from our ECG-2014-ePub. 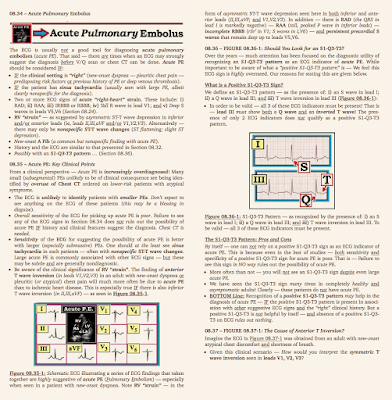 These pages summarize the ECG findings of Acute PE (Pulmonary Embolus). Does the ECG in Figure-1 show evidence of anterior infarction or WPW? IF your answer is WPW — Where is the AP (Accessory Pathway) likely to be? Is AP localization on ECG clinically important? Figure-1: 12-lead ECG. Is there evidence of prior anterior infarction? (Figure reproduced from ECG-2014-ePub). NOTE — Enlarge by clicking on Figures — Right-Click to open in a separate window (See text). All 3 of the features of WPW are present in Figure-2. These include: i) short PR interval; ii) QRS widening; and iii) delta waves. Not all leads show delta waves. For example — there is no delta wave in lead aVL. It is not uncommon in patients with WPW for delta waves to only be seen in a few of the 12 leads. Furthermore, because conduction may be divided between impulses passing over the AP (Accessory Pathway) and the normal AV nodal pathway — the QRS will not always be as wide as it is in Figure-2. In addition to positive delta waves — there are also negative delta waves in Figure-2. These negative delta waves in leads V1,V2,V3 simulate anterior infarction. The ECG in Figure-2 also simulates LVH (given large amplitude of the R wave in V5,V6) and LBBB (monophasic slurred complex in lead I). However, since the patient has WPW — nothing can be said about the possibility of anterior infarction, LVH, or LBBB. Instead — all we can say is that there is sinus rhythm with WPW. Figure-2: Arrows highlighting delta waves have been added to the12-lead ECG previously shown in Figure-1. Thus, the patient has WPW. Nothing can be said about the possibility of anterior infarction since the patient has WPW. Where is the likely location of the AP? 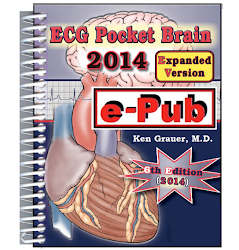 (Figure reproduced from ECG-2014-ePub). HOW to Determine the Likely Location of the AP? Delta wave morphology and orientation on 12-lead ECG may assist in surprisingly accurate localization of the AP (Accessory Pathway) in the patient with WPW. This is of more than academic interest to the EP cardiologist — as it facilitates and expedites localization of the AP during EP (ElectroPhysiology) study. In addition — it helps in planning the procedure as well as in patient discussion, since risks of catheter ablation and likely success rates are based in part on localization of the AP. We emphasize that ECG localization of the AP is an advanced topic beyond the clinical needs of the non-cardiologist. Practically speaking — it suffices to recognize WPW and IF there is need for referral. That said — ECG localization of the AP is not necessarily difficult if certain parameters are followed. 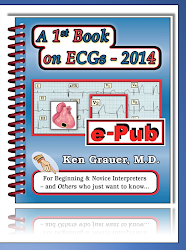 Das MK, Zipes DP: Electrocardiography of Arrhythmias — A Comprehensive Review (ePub book). Elsevier-Saunders, Philadelphia, 2012. 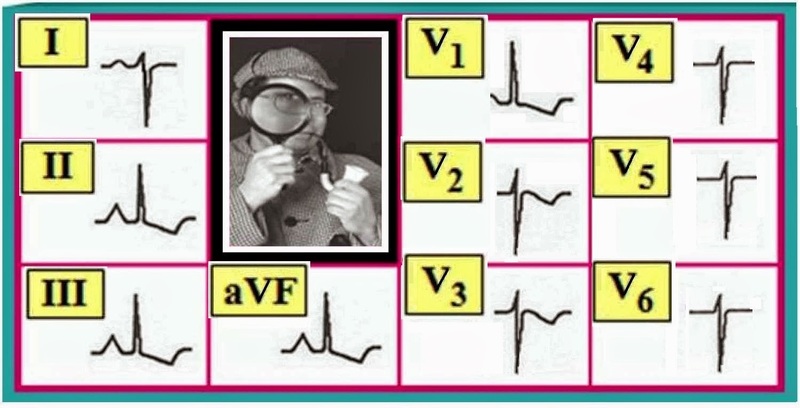 Fitzpatrick AP Gonzales RP Scheinman MM, et al: Algorithm for the Localization of Accessory Atrioventricular Connections Using a Baseline Electrocardiogram. J Am Coll Cardiol 23:107-116, 1994. ECG localization of the AP is not perfect. Accuracy of ECG localization is clearly suboptimal if there is less than maximum preexcitation — as may occur when the QRS is minimally widened because a substantial portion of ventricular activation is occurring by transmission of the impulse over the normal AV nodal pathway. Approximate distribution of AP sites is the following: i) Lateral (Left Ventricular) Free Wall — ~50% of APs; ii) Right or Left PosteroSeptal Area — ~20%; iii) RV (Right Ventricular) Free Wall — ~20%; and iv) AnteroSeptal Area — ~10%. On occasion — more than a single AP may be present in a given patient. Together with variation in the relative amount of AP vs normal pathway conduction — this may account for changing delta wave morphology that can sometimes be seen from one ECG to the next in a given patient. As a general rule — IF the delta wave (first ~40msec of the QRS) is upright (positive) in lead V1 (RBBB pattern) — then there is a LEFT-sided AP (as in Step A-1). IF the delta wave is downward (negative) in lead V1 (LBBB pattern) — then as a general rule there is a RIGHT-sided AP (The major exception to this is when transition occurs between leads V1-to-V2 — as described in Step B-1). Measure the sum of delta wave polarities in the 3 inferior leads (II,III,aVF) — giving a score of +1 if the delta (first 40msec of the QRS) is positive; 0 if the delta is isoelectric; and -1 if the delta is negative. IF Sum of inferior lead Polarities is +2 or +3 = AnteroLateral LV Free Wall AP. IF Sum of inferior lead Polarities is less than +2 — then the AP is posterior. IF Sum of inferior lead Polarities is -2 or -1 — and — the R wave in lead I is at least 0.8mV (8 mm) more than the S wave in lead I = PosteroSeptal AP. Otherwise = there is a PosteroLateral LV Free Wall AP. IF the R wave in lead I is less than 1.0mV (10 mm) greater than the S wave in lead I = then there is a LEFT-sided AP. In this case — Proceed as above (Step A-1) for when the QRS is UPRIGHT (beginning by measuring sum of delta polarity in the inferior leads to determine if the AP is anterolateral — posteroseptal — or posterolateral). But IF the R wave in lead I is at least 1.0mV (10 mm) more than the S wave in lead I = then there is a RIGHT-sided AP. In this case — Proceed as described in Step B-2. Step B-1: How to Tell IF the AP is RIGHT-sided? When the QRS complex is predominantly downward (negative) in lead V1 — and — transition (where the R wave becomes taller than the S wave) occurs after lead V2 — then there is a RIGHT-sided AP. As stated above there can also be a RIGHT-sided AP — IF transition occurs between V1-to-V2 — and — the R wave in lead I is at least 1.0mV (10 mm) more than the S wave in lead I.
Localization of a right-sided AP will depend on where transition occurs. There are 3 possibilities. Transition may be: i) before (or by) V2-to-V3 (Step B-3); ii) between V3-to-V4 (Step B-4); or iii) after V4 (Step B-5). IF Sum of inferior lead Polarities is -2 or -3 = PosteroSeptal AP. IF Sum of inferior lead Polarities is -1, 0 or +1 = MidSeptal AP. IF Sum of inferior lead Polarities is +2 or +3 = AnteroSeptal AP. Measure delta wave amplitude (first ~40msec of the QRS) in lead II. IF the delta wave in lead II is at least 1.0mV (10mm) = Septal AP. To then find out which septal area is involved — Proceed as above for when transition is between V2-to-V3 (Step B-3). IF the delta wave in lead II is less than 1.0mV (10mm) = RV Free Wall AP. To determine IF the AP is located on the anterolateral or posterolateral RV Free Wall — Proceed as below for when transition is after V4 (Step B-5). Measure the delta wave frontal axis (looking at delta wave polarity in leads I and aVF). IF the delta wave frontal axis is positive (= more than 0 degrees) = Anterolateral RV Free Wall AP. But IF the delta wave frontal axis is negative (= less than 0 degrees) — then look at the R wave in lead III. IF delta wave frontal axis is negative — and — the R wave in lead III is net positive = AnteroLateral RV Free Wall AP. IF delta wave frontal axis is negative — and — the R wave in lead III is net negative = PosteroLateral RV Free Wall AP. Figure-3: Where is the AP likely to be? 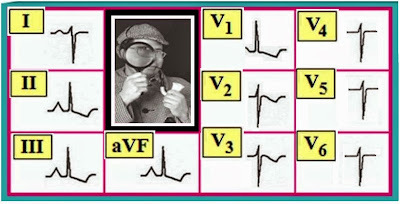 Let’s apply the above approach to AP localization to the ECG from Figure-2 that we again show in Figure-3. Where is the AP likely to be? Figure-3: Sinus rhythm with WPW (ECG repeated from Figure-2). What is the likely location of the AP? — See text. (Figure reproduced from ECG-2014-ePub). ANSWER to Figure-3: Where is the AP? Since the QRS complex in V1 is negative — we skip over Step A-1. Transition (where the R wave in precordial leads becomes taller than the S wave) is not between V1-to-V2 — therefore we also skip over Step A-2. According to Step B-1 — the AP is right-sided (because the QRS is negative in V1 and transition occurs after lead V2). Transition occurs between V3-to-V4. Therefore we skip to Step B-4. We are asked to measure delta wave amplitude in lead II. Realizing that it is not always easy to distinguish the precise end of slurring from the delta wave vs fusion with the remaining portion of the QRS — it looks like there is a markedly positive delta wave (of at least 10mm) in lead II. This suggests a Septal location for the AP. To determine the likely part of the septum that is involved — We are asked to return to Step B-3. Delta wave polarities are clearly positive in each of the inferior leads — therefore we suspect an AnteroSeptal AP location. Figure-4: Where is the AP likely to be? Let’s apply the above approach to the example of WPW shown in Figure-4. Where is the AP likely to be? Figure-4: Sinus rhythm with WPW. What is the likely location of the AP? — See text. (Figure reproduced from ECG-2014-ePub). ANSWER to Figure-4: Where is the AP? Since the QRS complex in V1 is upright — we begin with Step A-1. Because the QRS is positive in lead V1 — we already know we are dealing with a LEFT-sided AP. The sum of delta wave polarities is at least +2 (decidedly positive delta waves in leads II,aVF — though no more than minimally positive in III, if not isoelectric in this lead). Therefore — we suspect an AnteroLateral LV Free Wall AP. Editorial Comment by the Author: Realize that many algorithms have been proposed for ECG localization of the AP. None are perfect — and the “ultimate test” is precise localization by EP study. We hope the above proposed approach simplifies this topic for you and is helpful in allowing a rapid educated guess as to AP localization based on ECG appearance. Acknowledgement: My appreciation to Michael Frease for providing me with the ECG in Figure 4, and allowing me to publish this. 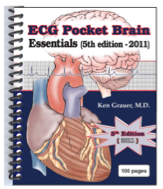 CLICK HERE — for a pdf of our Section 05.36 on WPW (excerpted from ECG-2014-ePub). 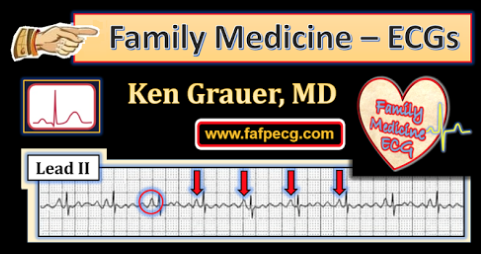 For an example of very rapid AFib with a wide QRS — Check out our ECG Blog #37.